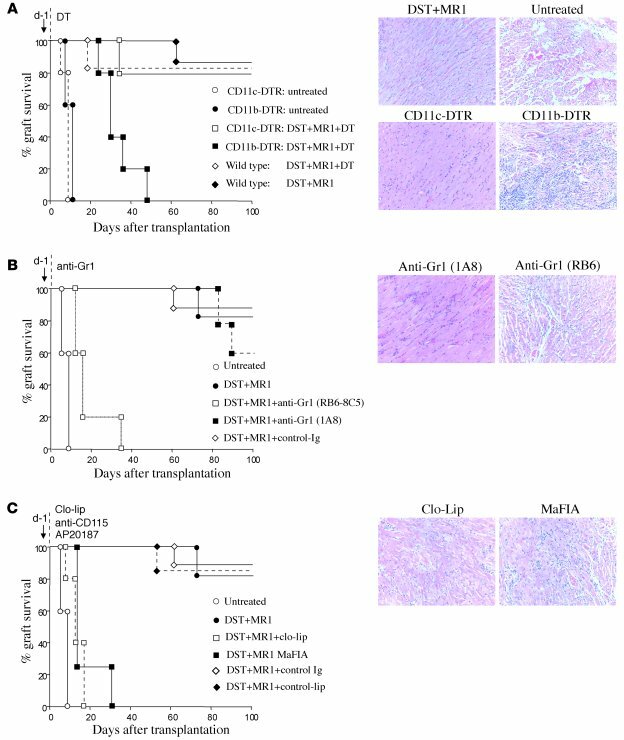 CD11b+CD115+Gr1+ monocytes are required for tolerance induction to vascularized allografts. (A) Fully allogeneic vascularized cardiac grafts were accepted in tolerogen-treated (DST plus anti-CD40L mAb) CD11c-DTR mice (n = 10), but rejected in tolerogen-treated CD11b-DTR mice (n = 10), after DT administration. (B) Fully allogeneic vascularized cardiac grafts were rejected in tolerogen-treated mice that received the anti-Gr1 mAb RB6-8C5 (n = 10), but accepted in tolerogen-treated mice that received the anti-Gr1 mAb 1A8 (n = 10). Untreated rejecting controls were as in A. (C) Fully allogeneic vascularized cardiac grafts were rejected in tolerogen-treated mice that received clodronate loaded liposomes (clo-lip; n = 10) and in tolerogen-treated MaFIA mice (n = 10) following depletion of CD115-expressing cells. Untreated controls were as in A. Also shown are representative allograft images of H&E staining of the indicated groups at day of rejection or after 100 days of allograft survival. Original magnification, ×40.